Comparing my Burmester 011 preamplifier to the company’s new 088 preamplifier reminded me of two other German high-performance machines I’ve sampled: Audi’s 430hp eight-cylinder R8 and its new 525hp 10-cylinder model. Both cars are outstanding and from the outside, look virtually indistinguishable. Much as you want to convince yourself that 430hp is enough, all it takes is a quick spin around the block and suddenly, you can’t live without the extra performance. The Burmester 088 is equally exciting—the minute you hear it, your perception is similarly altered. At first glance, the 088 looks identical to the 011, with the input selector on the left and volume control on the right. The current preamplifier allows more set-up capabilities on the front panel, as well as switching between SPDIF and USB digital inputs. For listeners that don’t need an onboard DAC or phonostage, the 088 can be configured with an additional unbalanced (RCA) high-level input. At press time, pricing was not available for this configuration. If you’ve never had the Burmester experience, know that the company’s products are electrically and mechanically built to an incredibly high standard. Front panels are machined to a “jewlers finish” and are of the finest quality we’ve ever experienced. Even when photos of Burmester’s metalwork get zoomed to 400% on a 30” Apple Cinema Display, it appears completely smooth. It’s like chrome-plated glass. If you are even the slightest bit obsessive compulsive, chances are you’ll be using the remote to keep the chrome free of fingerprints—even though it’s easy to clean. Fortunately, the sound is as exquisite as the casework. 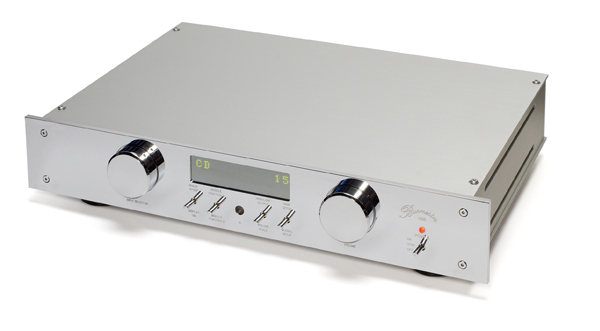 The new 088 represents a significant step up from the 011 preamplifier it will replace. (For now, the 011 remains in the Burmester lineup but will disappear in the near future.) While the 088 incorporates a number of evolutionary changes, the biggest difference relates to the incorporation of Burmester’s latest X-Amp 2 gain modules. The latter are used in all of the Reference Line components, as well as the 100 Phono Preamplifier that we recently reviewed. Note: These modules are hand-built with matched discrete components throughout; no op amps are used in the amplification chain. While older preamplifiers like the 011 boast a few unbalanced inputs and a pair of unbalanced variable outputs, the 088 is balanced throughout and utilizes XLR inputs and outputs. This may prove inconvenient for some. Unless you have a studio tape recorder, the tape outputs will require an XLR to RCA adaptor, easily sourced from your Burmester dealer. The XLR pin out is also different on Burmester gear. Almost every other hi-fi manufacturer follows a standard formula in which pin number one is the ground (as it is in pro audio gear), pin two positive, and pin three negative. Burmester is just the opposite, with pin two being negative. If you mate Burmester gear with other manufacturers’ components, doing so requires a special XLR adaptor, custom cables, or switching your speaker leads from positive to negative to make up for the phase difference between components. Intuitively, the 088 has a phase switch on the front panel. So, when using the ARC REF 2 phono preamplifier, a flick of the switch achieved absolute phase throughout the system. The 088 offers five balanced inputs and, for those wishing to integrate the 088 in a multichannel system, a surround pass through. A single set of variable level XLR outputs is the only shortcoming. Anyone with a powered subwoofer will have to resort to some kind of “Y” adaptor or purchase different speakers. Hopefully, this limitation will be remedied once a mark II version of the 088 becomes available. Having lived with the 011 preamplifier and 911 Mk.3 power amplifier for the past two years, the combination’s natural sound became burned into my memory. But after the 088 was powered up for two days and fully stabilized, the difference was immediately noticeable—and all for the better. 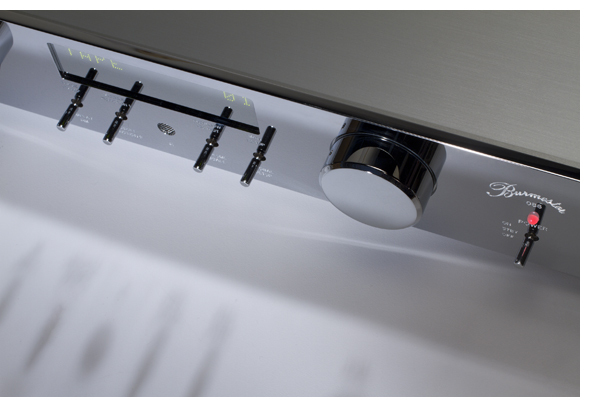 From its entry-level Rondo Line up to the Reference Line, all Burmester gear has a similar tonality. Still, a higher level of performance exists in four specific areas: increased dynamics, added bass weight, lower noise floor, and greater overall resolution. With the 088 as quiet—if not more so—as the 011, the unit’s increased dynamic impact revealed itself on “Take It So Hard,” the first track off Keith Richards and the X-Pensive Winos’ Live at the Hollywood Palladium. Decidedly not a record with an audiophile pedigree, the drums are nevertheless miked incredibly well, something I noticed on a recent jaunt in editor Bob Gendron’s car. I also forgot how much fun this record can be. Through the 088, the drums exploded out of my speakers. By comparison, they were noticeably more subdued when I returned to the 011. Bass detail also stood out from the 011, with the 088 claiming more weight and control. Rock, jazz, and classical music all equally benefited. After queuing up Kanye West’s recent My Twisted Dark Fantasy, the title track’s beats went straight to the gut in a way they never did before. On first listen, even with the 011, West’s album felt fairly dense. Yet the 088 unraveled the layers of texture with fantastic results. This upshot remained consistent with everything auditioned. Moderately dense and compressed recordings sounded more open than I could’ve imagined, and great recordings became sublime. In projecting an expansive soundstage well beyond the boundaries of the GamuT S9s, the 088 helped the six-foot-tall speakers disappear, as if they were a pair of mini monitors. With such depth, there’s just no need for surround sound! And honestly, there’s no need for vacuum tubes, either. Resolving low-level detail and texture constitute the most interesting aspects of the 088’s incredible performance. A few of my favorite vocal records instantly brought such traits home. Regardless of playback volume, my system achieved a new level of overall clarity. Digital now sounded almost as grain-free as analog did with the 011. And the analog presentation? Delicious. Spinning Mobile Fidelity’s reissue of Frank Sinatra’s Nice ‘N’ Easy clearly illustrated the 088’s marvelous capability, as it not only succinctly defined the room size, but perfectly reproduced the illusion of height—putting Sinatra front and center with his voice where it would be if he were standing eight feet from my listening position. Such an accomplishment is rarely be achieved when playing music back through electronics, yet the 088/911 combination achieved it with ease. I’ve never heard Sinatra live, but I have had the privilege of hearing the Fleet Foxes up close and personal. On the 088, the group’s “Tiger Mountain Peasant Song” possessed sizeable body and depth. At this point, the illusion neared much closer to reality. Even after full-day listening sessions, the 088 never ceased to amaze, especially with records often as test tracks, regardless of resolution. Even Rhapsody tracks were more palatable to the senses. The 088’s internal DAC is an upsampling 24 bit/192khz design that upsamples all incoming data to 24/192. While some may shy away from this approach on principal, Burmester’s implementation is one of the most transparent I’ve experienced. Feeding the DAC section with both the Sooloos via SPDIF and a current iMac running Pure Music nearly finished in a dead heat, with a slight nod to the SPDIF input in terms of overall musicality with 16 bit/44.1khz tracks. When I switched to high-resolution files, the USB input fared better. The Simaudio 750D ($12,000) and Burmester 089 ($28,995), along with the four-box dCS Paganini ($55,900), offered higher performance than the onboard DAC. Nonetheless, the 088’s digital capabilities should be a great addition for anyone getting started with computer audio. It provides performance that’s on par with the best DACs I’ve heard in the $4,000 – $5,000 range. (And remember, there’s no power cord or interconnects to buy.) It could also prove excellent for vinyl listeners that only occasionally listen to digital. Those that listen to analog and digital with equal enthusiasm will be best served with an outboard albeit higher-performance DAC; Burmester’s 089 is the obvious choice. While the Burmester 088 preamplifier costs nearly a third more than the 011, the model it’s replacing, the unit is definitely worth the price. Sure, $30k is a healthy sum to pay for a single component, but this is a hand-built, high-performance preamplifier with performance equaled by few preamplifiers at any price. Because it’s massively overbuilt, the 088 should be a destination that you will never leave. To those always in the hunt for the latest thing, be forewarned: Refrain from trading it in before you’ve really had the chance to realize what the 088 can do. Should you be a music lover that wants to cease the tiring practice of upgrading and simply enjoy nirvana for a very long time, the 088 has the potential to become a family heirloom.